Squirrels villege and Gifu castle. 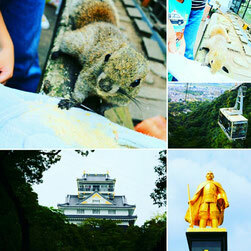 You can touch and feed many squirrels in Kinka mountain it's located in Gifu-city . also there're Gifu castle and cable cars from Gifu park to top of the mountain, the hiking couse available it takes 40 to 80 min.The castle was build in 1201one of the Loads is famous popular samurai Oda Nobunaga. Prices・・Squirrel village 200yen, entering castle 200yen, castle cars 1080yen.